Cubase Artist 9.5 is based on the same technologies offered within Steinberg's advanced music production system, Cubase Pro. Cubase Artist 9.5 combines audio and MIDI recording and production, with many creative tools and instruments. WaveLab Elements 9.5 comes with audio editing features and mastering capabilities alongside Internet audio publishing features to enhance any recording for CD and Internet. The ST-H01 studio monitor headphones' specifications deliver an equal response range, boasting accurate bottom end while extending brilliance into the high-frequency range. 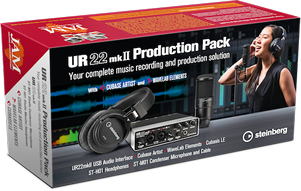 Steinberg's Senior Marketing Manager, Stefan Schreiber, commented: "The UR22mkII audio interface is a staple within the community of aspiring producers. Together with included recording, production and mastering software as well as the headphones and microphone, one gets an all-in-one deal — not to forget that every purchase supports the humanitarian organization Joint Aid Management." UR22mkII 24-bit/192 kHz USB 2.0 audio interface with 2 D-PRE Class-A discrete mic preamps supporting +48 V.
Cubase Artist 9.5 music production system with complete audio/MIDI recording, editing and mixing tools. Includes virtual instruments: HALion Sonic SE 3 workstation, MPC-style Groove Agent SE 4 drum machine, Padshop and Retrologue synthesizer. Comes ready with a suite of over 70 audio and MIDI VST effect processors, including Pitch Correct for vocal intonation correction, VST Amp Rack guitar tone suite and many more. WaveLab Elements 9.5 personal audio editing system with powerful editing and analysis tools, a valuable selection of restoration and mastering plug-ins, a CD-burning engine and much more. ST-M01 studio condenser microphone with mic mount and a low-noise microphone cable. Cubasis LE DAW application for iOS. According to reviewers the headphones are anything but neutral, they boost the bass and are of mediocre build quality.